MJR - Men’s Large Diamond Wedding Ring This Men’s Large Diamond Wedding Ring is the ultimate example of when quality meets design. It combines traditional gold with modern cobalt ring, tungsten ring or ceramic ring, and features a dazzling display of sparkling diamonds spaced evenly across the front of the ring in three elegant sections. Available in several variations including different ring widths, gold karat and gold color, this stylish ring for men would make a fabulous anniversary gift. This Men’s Large Diamond Wedding Ring is the ultimate example of when quality meets design. 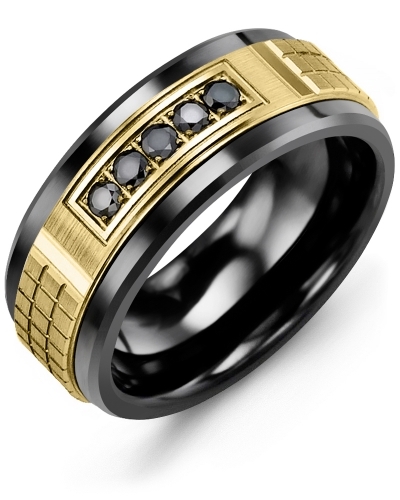 It combines traditional gold with modern cobalt ring, tungsten ring or ceramic ring, and features a dazzling display of sparkling diamonds spaced evenly across the front of the ring in three elegant sections. Available in several variations including different ring widths, gold karat and gold color, this stylish ring for men would make a fabulous anniversary gift.